Cut the Line (1944), Thomas Hart Benton. Image courtesy of the Navy Art Collection, Naval History and Heritage Command, Washington, D.C. This exhibition presents an important series of works from the peak years of the artist’s fame and influence. Following the Japanese attack on Pearl Harbor, he used his art to honour American troops and to maintain national morale throughout WWII. 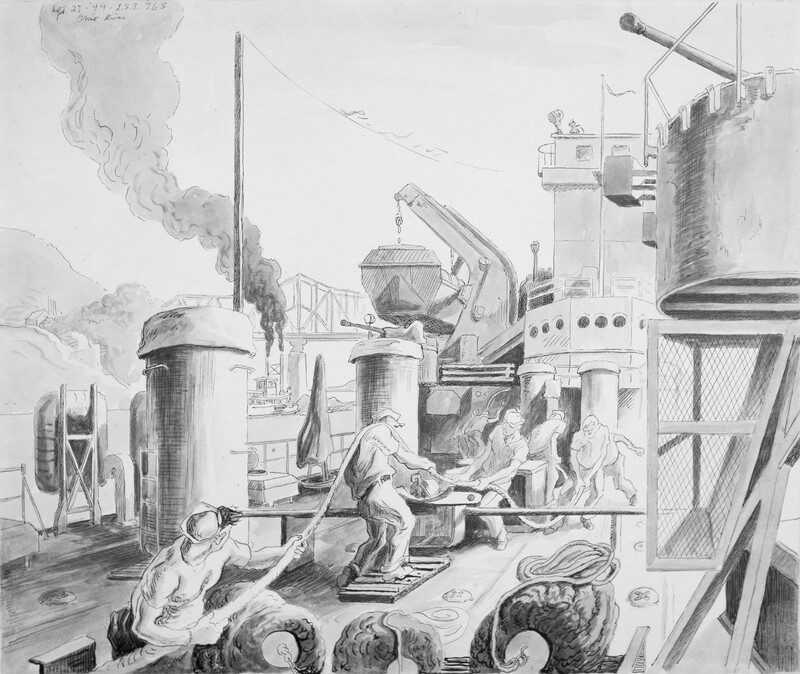 With sponsorship from Abbott Laboratories, a leading maker of pharmaceuticals and medical supplies, Benton served as a commissioned artist-correspondent in the U.S. Navy, with privileged access to shipyards and submarines. The works in this series are not recreations of famous foreign battles as imagined based on photographs, but images drawn from his firsthand observations. These works demonstrate Benton’s commitment to storytelling and patriotic subjects which remained a driving force throughout his career. Find out more about the Thomas Hart Benton exhibition from the Chrysler Museum of Art’s website. Up the Hatch (1944), Thomas Hart Benton. Image courtesy of the Navy Art Collection, Naval History and Heritage Command, Washington, D.C.
Coffee and Chow (1944), Thomas Hart Benton. 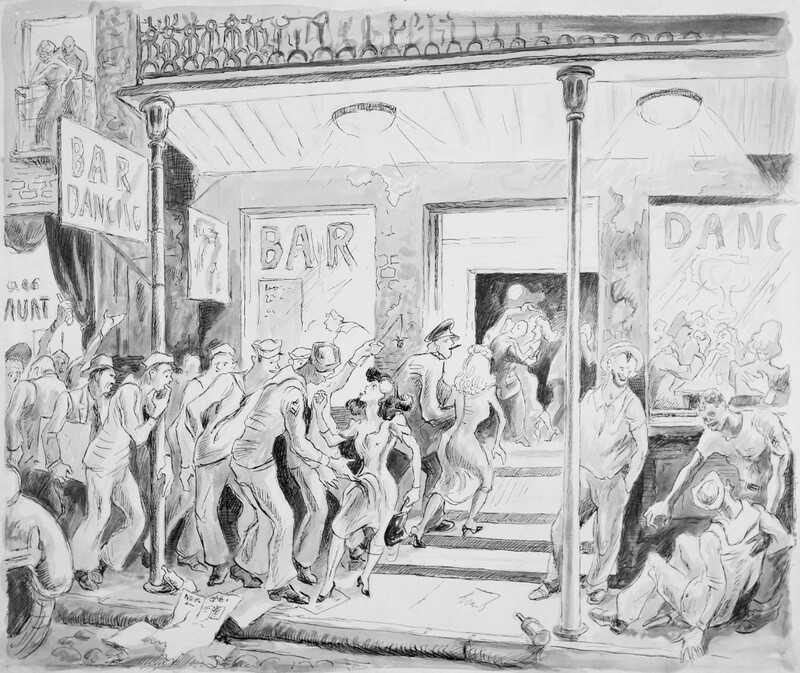 Image courtesy of the Navy Art Collection, Naval History and Heritage Command, Washington, D.C.
Time Out From War (1943), Thomas Hart Benton. Image courtesy of the Navy Art Collection, Naval History and Heritage Command, Washington, D.C.
Slumber Deep (1944), Thomas Hart Benton. Image courtesy of the Navy Art Collection, Naval History and Heritage Command, Washington, D.C.
Born in Neosho, Missouri, in 1889, Thomas Hart Benton began his art education at age 16 in the Art Institute of Chicago and at age 19 studied in the Latin Quarter of Paris. Returning to America to become a "child controversy," Benton enjoyed one of the most dramatic and interesting careers in American art. Deeply moved by the attack on Pearl Harbor, shortly thereafter he completed "The Year of Peril," a series of grim and powerful war paintings financed by Abbott Laboratories. In 1943 he collaborated with Georges Schreiber in producing the Abbott Collection of Submarine Paintings, a project largely executed aboard the American submarine USS Dorado (SS 248), which was later lost in action with all hands. His awards included the Jennie Sesnan Medal of the New York Architectural League and Wanamaker's Purchase Prize. Benton is represented in the permanent collections of the Metropolitan Museum, Brooklyn Museum, Sheldon Swope Art Gallery, Pennsylvania Academy of Fine Arts, City Art Museum of St. Louis, Museum of Modern Art, California Palace of the Legion of Honor and others. His murals are in the Missouri State Capitol, Indiana University, Whitney Museum of American Art and the New School for Social Research. Shortly after the end of the war, Abbott Laboratories donated the wartime art it had financed to the U.S. government, and that is how these particular works became part of the Navy's art collection. A heroic period in American history as captured by one of the quintessential American painters of the era: That's the story with Thomas Hart Benton and the Navy, an exhibition of steel, smoke, saltwater, and sinew all captured in a signature style. Benton was on a speaking tour when he learned of the attack on Pearl Harbor, and he secluded himself for six weeks to produce eight powerful—some would say disturbing—paintings for the war effort. The Year of Peril brought him to the attention of Abbott Laboratories, a Chicago pharmaceutical company that wound up underwriting Benton's work throughout the war. 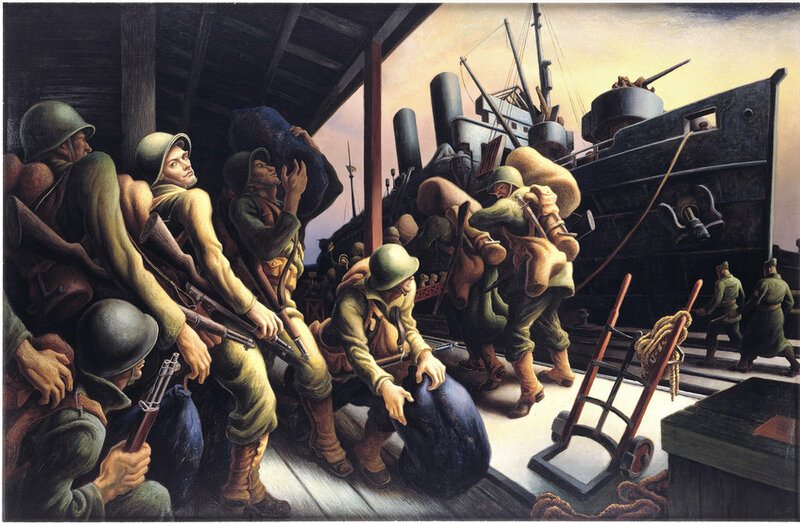 Abbott later donated many of Benton's World War II era paintings to the United States Naval History and Heritage Command, which generously lent them for this exhibition. Thomas Hart Benton, Up Periscope, oil on canvas, 1944. All images courtesy of the Navy Art Collection, Naval History and Heritage Command, Washington, D.C.